Steamer "Idaho" built 1860. Operated until 1881 between the Dalles and Upper Cascades of Columbia River. Afterward transferred to the Puget Sound. 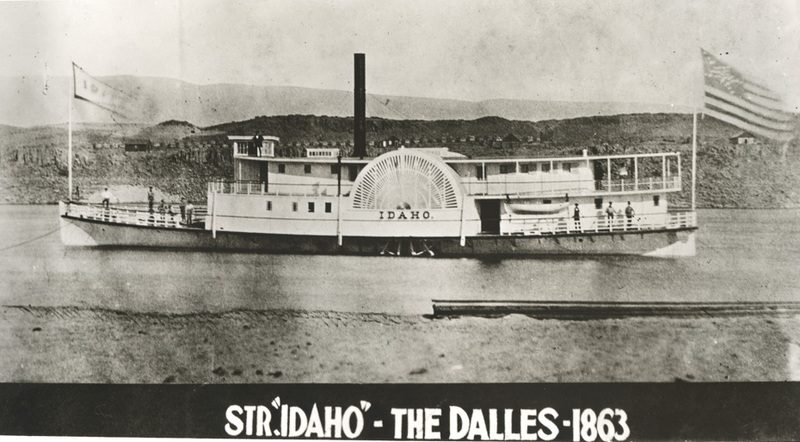 It has been asserted that the name of the state of Idaho was suggested by its use on this steamboat. When I first saw this image I wondered if this was the steamer which Nathaniel Coe took to the Dalles when he brought bunting to be sewn into the "Coe flag". Then I noticed the flag on the stern of the ship. Is it possible this sidewheeler is actually flying the Coe flag? Plusses: It looks like the right size and design. We know Henry Coe served as a ship captain, and the Coe flag eventually made it back to Hood River by way of Henry Coe. Minuses: there is no evidence that Coe was ever in command of the Idaho, and there are some details in the shape of the constellation of stars which are different. Note that in the Coe flag the constellation points straight down, while this one tilts a little to the right. My conclusion is this probably isn't the Coe flag, but it's a safe bet that both Nathaniel and Mary Coe saw this flag on many occasions, and it might have even inspired them to the size and design of their flag. Where is the "Upper Cascades of Columbia River?" I read that to mean it operated between the Dalles and what is now Cascade Locks. I believe upper cascades is Celilo Falls and lower cascades Cascade Locks. great looking steamer.....what is on the flag in front? Like the term "Cape Horn", the term "Cascades", can be confusing when dealing with the Columbia River. I think there were three Cascades in the area of Cascade Locks and Bonneville Dam. With the Bonneville Pool we have lost perspective of what the rapids were like through that area. I think there was an Upper, Middle and Lower Cascades and I think each one had a Block House during the Indian scare. Whatever the proper names of the different cascades, it's been documented this ship served the "Middle Columbia" which included Hood River and the Dalles (below Celilo), so she would have been a common sight and critical lifeline to early Hood River settlers. and there is a link to the Cascades Rapids. On the Washington side was what was originally called Rockland (now considered Dallesport.) Prior to Goldendale becoming the seat of government it was at Rockland. In order to get from Rockland to the Goldendale area you had to go up and over on a wagon road. Rockland and The Dalles were connected by what was called the "Rockland Ferry." No churches in Rockland, so those wishing to attend Sunday worship had to come over on the ferry. It landed down close to where the Umatilla House was located. How many people actually lived in Rockland I don't know, but know at one time there was a shoe factory of some sort there. I know that a Thomas Johnson was involved in most things going on over there. When John Golden platted out Goldendale he offered Johnson 4 lots if he would come to Goldendale and establish a general store. He accespted offer built a large structure, housing the store in the front and his residence in the back. When my great-great grandparents arrived in Goldendale, they had no place to live. They had come from Wisconsin, as my great-great grandfather and John Golden had met as "young sprouts" in the California gold fields in "49 and had kept in contact. They went to the store to inquire if there might be something available, as they had two young children and a very ill baby (turned out to be Whooping Cough which caused his death when he was about 9 months old. Talk about generosity, Thomas Johnson took them into his own home. They were there for some time before they moved into other accommodations. Thomas Johnson had a sister Ann, who ended up marrying a much, much older Methodist minister, Gustavus Hines. He was very involved with Jason Lee at Willamette Mission in Salem. He was the serving missionary/minister in The Dalles. Gustavas had been involved at Champoeg when the conference was held there prior to statehood. Numerous articles out there about Hines. Hines' had one daughter, Gussie, which there is quite a story about. Thanks Charlott for the interesting information. I looked up Gustavas Hines and he looks like a good source of early PNW history. Since it is June right now, and we are in a red flag warning for fire danger, I found this interesting. I just read a brief on his account of fires in 1837. 1881 Wildlife in Oregon. New York, NY: Hurst & Co., Publishers. Mentions of prairie and forest fires in August 1837 in the upper Willamette Valley and the mid-Umpqua Valley on pages 96 and 98, then again on September 1st while coming back on the same trail (page 118) These fires were most likely Indian set." Yes, Gustavas was quite an early part of Oregon history, as was his brother, who was also a Methodist missionary/minister. Gustavas was very instrumental in getting a Methodist church going in Goldendale, with the help of Wheelhouse, then the one down at little Columbus, which Wheelhouse was very instrumental is getting it started. Gustavas died when Gussie was an infant and eventually her mother died of T.B in Goldendale. The Hines' must have had great faith and trust in the Wheelhouse's as they took Gussie in as their own. Though Gustavas and Ann are buried in Salem with Jason Lee and the other prominent Methodist missionaries of the era. Gussie grew up with some of my great-great grandmother's children in Columbus until she tragically died at age 8. I have always wondered if any of them knew of the Hines-Wendell connection back in upstate New York. I guess it was possible. The Upper Cascades was the Cascade Locks area, the Middle Cascades was the stretch of river near Sheridan Point and the Lower Cascades was the Hamilton Island area below present day Bonneville Dam. All three of these areas came under protection of the US Army and blockhouses were constructed at all three points as a result of the massacre that occurred in the 1850s in this area. The Idaho was built and operated by the Oregon Steam Navigation Company to ferry passengers and freight back and forth between The Dalles and the Upper Cascades, which was a steamboat landing complete with railroad trestle and small community surrounding it on the WA shoreline on the west side of present-day Ashe's lake, just below Stevenson and where Highway 14 comes down off the hill from the Bridge of the Gods. This was the east head of the OSN's portage around the rapids. The banner on the bow of the Idaho just bears the boat's name. This was a common banner for these boats to fly from the 1860s to 1890s or so.